Optimal FO squad? I need to know! Anyone been able to test out a maxed KRU-lead FO team against the current meta? There are no videos out so far (looking at you, Mobile Gamer and Ahnald) and I want to know if it's worth it to invest in KRU, or finally jump ship. I've been using FO in Arena since May, and I started farming FO back in February because I was predicting new OP toons to be released with the movie. The time has come, and I need to know if I gambled successfully. Otherwise, time to hop on the CLS train. Speed wise, they are going to be YUGE with the unmasked ones leadership. FOO at 175, KRU at 162, KR/FOTP at 158, and FOST at 146. For comparison, R2-D2 is 157 speed and Thrawn is 150. Even TFP (fastest in the game) is 170, so with Kylo Unmasked, FOO is going to be the fastest in the game (ignoring, you know, other leader abilities like Tarkin). I'm one stun cuff away from g11 on KRU, at which point I'm going to move my arena mods over and use them, as I'm horribly bored with my CLS/RH/R2/GK/Thrawn team. I stay in the 30-50 range right now with my arena team ... although I will say I dropped to 99 (!!!!) a couple of days ago. I've decided that as long as I stay in the 50-100 arena range, I'm just going to roll with my FO team, if only because it's something new. Anyway, off to refresh the shop again and hope a stun cuff comes up. I really want to give it a go. Thank you! Dude, please let me know how the switch goes! So you'll be using FOO, KRU, KR, FOTP, and FOST? No Phasma? Well the way I see it, the two Kylo's are auto-includes. Every FO team is going to have them. That leaves three spots. 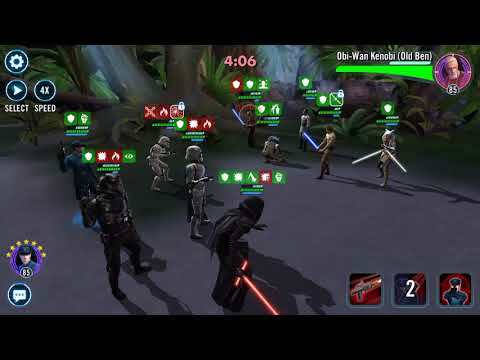 In my opinion, right now you need FOTP, especially with the extra crit damage from new Kylo (seriously, +40% crit damage!!!!!!!!). FOTP is going to bring PAIN ... and I love it. So he (she?) is always going to be included for the time being. Anyway, that leaves two spots. I'm definitely going to play around, but I think I really like the idea of FOST. He'll be calling assists, picking up the taunt when Kylo is fractured, and giving a nice hp/prot heal to the team with his taunt because of new Kylo's leadership, in addition to the 25% TM. So that leaves Phasma and FOO. I'll might swap between them to see who is better, but I do think FOO is the way to go. He's much faster and is a cleanser and healer now as well - seriously, cleanse+100% TM+Advant+OffUp+TenUp (so 15% HP/Prot) ... ****. Phasma brings a low damage aoe that will get her (or KRU) shredded against CLS team, and then 50% TM and advantage. That is a semi-decent heal, I guess, but for the buff itself ... well, at any given time at least two FO peeps will have advantage, so it's not game changing, imo. Anyway, yeah, I'm going to try Phasma just to see, but I do think she's the weak link now without her leader ability. I've been saving, FTP, for a month and a half or so - all gear and crystals tucked away. I used a bunch of my saved crystals to get new Kylo to 4 1/2 stars ... I *might* cave and buy the pack that gives 25 shards, then buy a couple of more crystal packs over the next couple of weeks to get him to 5 stars, but that'll be it. But for FOSFTP (that's a weird acronym), even if he was the next meta, no way am I paying $300-400 to get him to 7 stars, which you need for an attacker. Maybe in a year when I can farm him to 7 stars free. I do kind of like his special Oppressive Burst, though. It's like a mini-Ezra, but with the ability to stun instead of giving extra damage. But it would be cool to call FOTP for a double tap every 2 or 3 turns along with the chance for a stun. I don't think you can leave out FOO--his FO cooldown reduction is important. 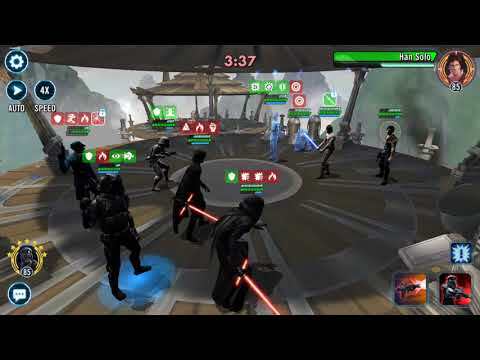 Phasma is tempting because of team TM+Advantage. But FOST's second taunt may be what keeps FOTP alive. I'm running KRU / Kylo / FOST / FOTP / FOO right now to great success in arena. The team feels very strong on offense. No clue on defense. It's complicated to play, which bodes poorly, but we will see. I'm trying different compositions with different teams in GW as a trial. I don't think there's a definitive 'FO Squad' but I am noticing differences in both. I suggest you do the same and see what suits you best. I like that UK gave us an option for leader with two totally different play styles. 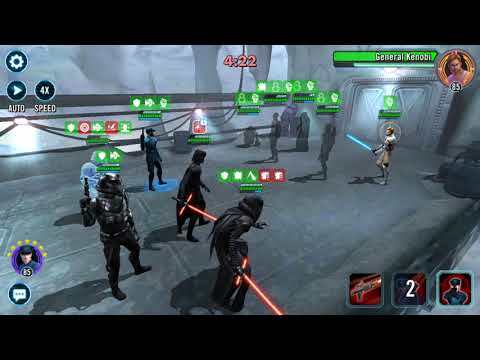 -Phasma lead with zzUK as a support isn't necessarily bad, it's actually quite good since he gets tons of extra turns. Don't count Phasma out by any means. -I do know this, if you're not running zFOTP with the zzUK lead you're crazy. The crit damage increase is insane and he hits HARD. With his foresight and Health/Prot regeneration it's pretty much a no-brainer. -I am thinking the FOSFTP is going to synergize with a Phasma lead the best. I didn't blow a pile of cash on SFTP as I did on UK so I don't have much feedback but if you play it out in your head it benefits greater. If you can get his/her speed up enough to take turn one, even as an AOE risk, the whole team gets speed up PLUS the multi-attacks. It would begin a rage of assault. -In a different light, SFTP granting speed up to a team that is already +30 from zzUK lead, is also a frightening but welcome thought. All in all, the jury is still out, and we should keep sharing our feedback so we can come close to constructing the 'perfect' FO Squad. Looking forward to reading others' opinions as well. I like FOO. He’s a Raid Han counter. You have to stun him, otherwise FOO can just clear the stun first turn because he is the first character to go after that. He is a must include for me. Inserts FOO as fastest toon in the game. Goodbye fastest toon in the game. Simple answer. Don't bother with FO. Both teams are strong on offense. FO can beat pretty much any team on offense (with the new KRU at max). Resistance struggles to win on offense in arena without better mods than the opposition. So right now, I think FO is better, but that will likely change as characters continue to be released. Resistance is amazing in TB and HAAT though. There you have a good one. First video with the right mods. The rest + game changer videos a meeh. So I got Matt (the name is growing on me) to g11 and swapped my arena mods from CLS/Han/R2/Thrawn/GK to Matt/Zylo/FOZT/FOTP/FOO. Both my old and new arena teams are g11, so comparible. I think FO gets a pretty decent bump going to g12 though, so I guess that's my next challenge. The HP and Prot "heals" from FOO with Matt's leadership are noticeable. Zylo is da real MVP. I like his new lash out not triggering crit hits. I'm still trying to figure out speed order, and even how much it matters. FOO to Zylo and Lash Out, and everybody has 100% TM. I have Matt modded for speed using my GK mods. He has 215 speed + 30 from his leadership, so 245 speed. But I wonder if I shouldn't care so much about speed for him, and load up fully on Prot+HP+Defense. He'll be getting turn meter anyway, and as a pre-tank you want him going last to soak some damage. As I type this out, I actually do think this might be the way to go. I only have him at 72k HP/Prot ... maybe I need to drop a bunch of speed and see if I can get him closer to 85k. I just don't know. And finally, I might be warming up on Phasma as leader. I'll need to test it (obviously ), but given how many Han's are out there, I am seriously wondering if the "can't be critically hit while FO has advantage" is the way to go to not have my FOTP in the yellow after Han's first attack. Anyway, as I have time I'll probably burn through some crystal refreshes today in the arena to try out different things. I'll post results. To start, here is a fun (?) GW from this morning, full auto, on double speed. I'm not showing node 12 because it was GK/Zarriss ... I got GK down to a sliver of health before Zarriss healed him, but that entire fight before I stopped it took the same amount of time as the 11 nodes before it. Fun. From this morning. Not blowing me away, but I do think it's a modding issue on my part. I'm going to move my speed mods from Matt over to Phasma and then load up on HP/Prot. I'll get getting an extra 13.5k that way ... let's see how going full tank helps. Last video for the morning. The first part is just showing my mods and stats. Feel free to offer advice. Skip to 1:45 to see my FO team just get ... wrecked ... by CLS. Just ... ****. But hey, tank Matt is tankier now. I should mention these are the same teams I've been fighting most days with my original arena squad. I win the majority of the time against these teams, but also probably lose against them the majority of the time as well. I really miss Thrawn's fracture. Really, really. I'm going to sub in Phasma leader for, probably, FOO, and give that a few tries, but I'm also thinking I need Thrawn in there - he just does so much. So later today I'll probably try a Matt, Zylo, FOTP, FOST, and Thrawn team to see how they do. When a CLS team gets going, it is hard to stop. You have to keep control of the fight. I will try to get more videos up today vs CLS. Going to be tough to reliably win vs. CLS teams if you don't have GK / Shore with CD immunity OR R2 giving stealth so no counters. Han and CLS are so OP with straight damage output. 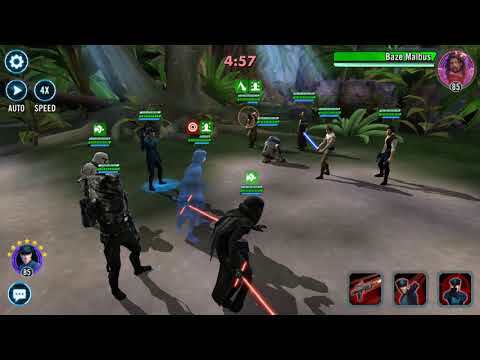 Not having thrawn to lock up enemy GK from doing the team assist / cleanse combo is also a problem. 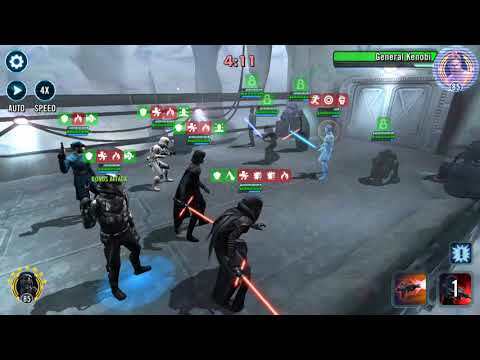 You need some way to mitigate their damage either with O down (Tarkin for example) or with CD immunity (GK / Shore)...or at a minimum at least use and R2 to stop the counter attacks. Ability to cleanse is also pretty important given all the stuns / speed downs / buff blocks / burn they put out also. News flash, but these CLS teams are really dang good. FO could use some decent updates on old toons and we'll also want to see what the new FO yet to be released can bring. I'm looking forward to seeing those videos, because I am being destroyed right now on my FO squad. Phasma leadership is WAY TOO SLOW. I tried a 'less meta' CLS squad (CLS, R2, Wiggs, Leia), and even that torched me. I'm too embarrassed to even put up the video. Before I got my first turn, FOST was stunned and Matt was ability blocked. My first attack was FOTP missing R2 on foresight and then hitting for 8080 on a CRIT hit. My heavy hitter is poking a non-tank for 8k on a crit? Anyway, 50 seconds later it was (mercifully) over. I do know my FO squad is only g11 and I'm going against full gold teams. Maybe I'm just spoiled that my 'meta team', also g11, is able to reliably win on offense. Maybe FO just peaks later than others. However, I also know that the FO team I have now is going to have problems challenging for 100 rank in the arena. I wouldn't be surprised if they have problems challenging for 200. I think I'm going to move my mods back to *sigh* CLS and call this a failed experiment. Here is a video against a CLO squad I did yesterday. It's not an auto-battle. FO is not OP and the next meta team. But they are different, fun, and can very reliably win on offense, especially as you get better with using them. My team is pretty geared and modded up, but so are my opponents. I made a number of notable mistakes in the fight and was still able to win convincingly. As the mistakes go down, it should get better still. 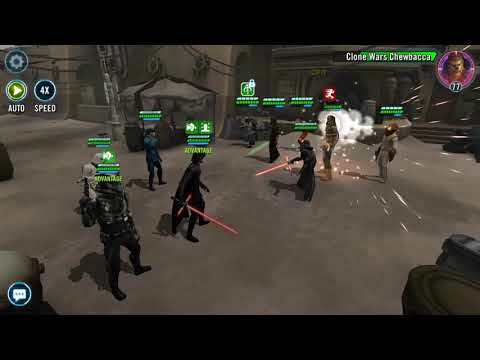 Original Kylo's stun is the difference maker there. It was also nice to see FOTP actually hit things hard - double tap for 42k was like WOW. It makes me wonder if I'm not modding correctly (although I do have 216% CD) ... should I be focusing on Offense mods? Or, more likely, it's the fact my FOTP is 1 piece of gear into g11 and probably missing out on some needed damage pieces. Anyway, I've decide FO is my new pet project. I'm going to start hording gear and work on getting the core characters up to gear 12 while waiting for December to see if they bring new characters out to shake things up. But in the meantime, it's *sigh* back to CLS for me. Still, awesome video to see how top level FO characters can fare against the meta, as opposed to my "bare g11 with decent mods" team. For mods for FOTP, I focus on a mix of offense and speed. I save my best speed mods for others, but still want a decent amount of speed on him. The nice thing is a double crit double tap is 40% TM with KRU lead, so he goes a lot. The other teams on my shard have equivalent mods, so mods aren't winning the fights. Hey guys, I run an FO team haven't got a zeta on KRU yet. I think there will be another toon for the movie to help out a little. On a side note would anyone be able to test Zavage under zKRU, I think it collild work really well with all the prot and health recovery. I believe that zKRU lead only effects FO toons, so Zavage wouldn't get that boost of health and prot from all the statuses he gains in battle. That's great. Very strong win. Team will definitely need to be controlled manually and have issues on D, but FOTP was very impressive and you can see the KRM leader showing there with the speed and damage. And we have more FO to come so there's only upside. Wow, thank you for that vid! So there is hope for FO to best the meta! Is that with a 4* KRU?